Complex of free-form amino acids in the same ratios found within tissues of sponges. Utilizes natural attractants and marine-derived proteins to improve feeding response and increase protein percentage of fish foods, respectively. Beneficial to all fishes whose diets are in large part composed of sponges, includingangelfishes, butterflyfishes, Moorish Idols, and their respective allies. Formulated based upon sponge tissue analysis and marine finfish culture. 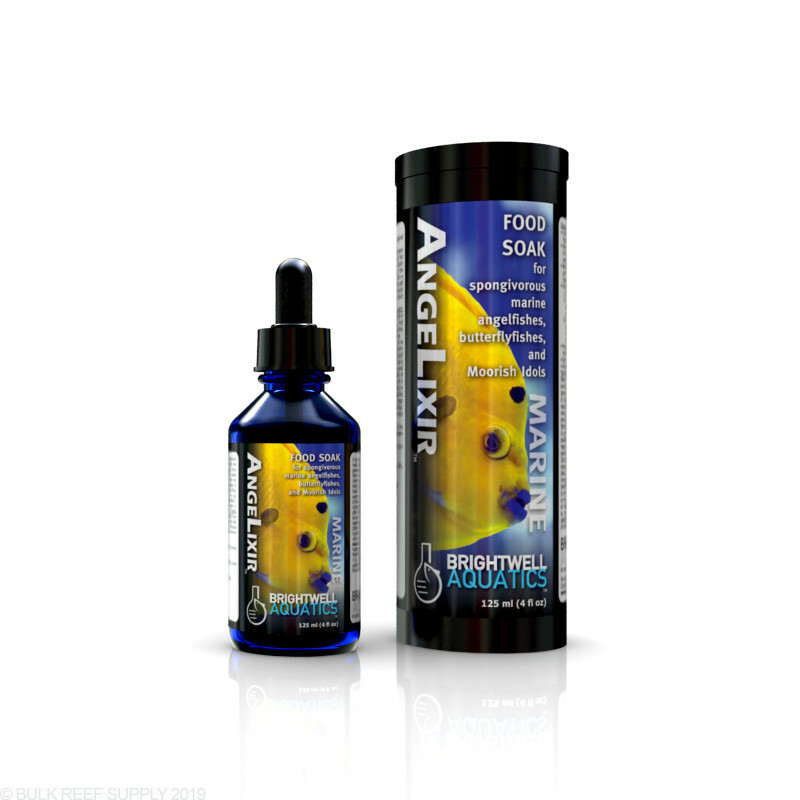 AngeLixir is readily absorbed by natural and prepared foods. Shake inner bottle well before each use. To fortify natural frozen foods: Rinse food in a fine-mesh net under running cold tap water until the food has thawed and the solution in which the food was frozen has been discarded. Then, squeeze as much of the excess liquid from the food as possible. Place food in a clean container, such as a small bowl or cup, and add only enough AngeLixir to saturate. Feed after 5 minutes have elapsed. Repeat three - five times daily to ensure that fish are receiving adequate food. To fortify freeze-dried and prepared foods (e.g. pellets): Place food in a clean container such as a small bowl or cup and add only enough AngeLixir to saturate. Feed after 5 minutes have elapsed. Repeat three - five times daily to ensure that fish are receiving adequate food. It has been our experience that natural foods, such as krill, mysis, and brine shrimp (thoroughly rinsed if frozen) are generally more readily accepted by newly introduced fishes than are most prepared foods, presumably due to familiar chemical and visual cues associated with natural prey items (as opposed to the relative unfamiliarity of prepared foods). If a fish has spent sufficient time in a retailer’s system to become acclimated to feeding on specific types of foods, it is wise to purchase and feed the same foods to increase the chances that the fish will begin eating shortly after introduction to its’ new surroundings. AngeLixir may be used to enhance the nutritional value of, and feeding response to, these foods. Observe water quality at all times, compensating for the increase in dissolved organic material entering the system with each feeding as necessary. Moisture (max) 99.00%, crude protein (min) 1.00%, crude fat (min) 0%, crude fiber (min) 0%. Purified water, proprietary complex of amino acids. When placing a fish into an unfamiliar aquarium environment, the first 7 - 10 days can be a critical period: depending on the method of capture and time in transit, and perhaps most importantly the feeding requirements of the species in question, some fish may refuse to eat for several days, during which time their energy reserves are depleted and chances of contracting illness are increased. It is therefore of vital importance to get the fish eating an appropriate food as soon as possible. Some species are more problematic in this regard than others; within the former group, various species of angelfishes, butterflyfishes, and the Moorish Idol are of particular note. AngeLixir improves feeding response and provides important amino acids in sponge tissue ratios, as well as providing marine proteins to increase the protein concentration in foods (particularly beneficial to fish that have lost body mass). AngeLixir is not meant to be a substitute for proper husbandry, or for making ethical decisions regarding the feasibility of maintaining spongivorous species in captivity; it is, however, an effective means of improving food palatability and nutrition, and increasing the chances of all fish species’ acceptance of unfamiliar foods. I purchased this product to treat the food I prepare for all my fish; however, the main goal was to keep my Moorish Idol eating and healthy. Of course there are many other things to consider such as water quality and parameters that impact overall fish health. I can't say this product is the sole reason my Moorish Idol, and all other fish are thriving, but I believe it is a huge reason. I am not going to stop using it to prove it is since my Idol has become an aggressive feeder. I recommend this product for picky eaters and to boost the general health of your fish. I use it to treat frozen food as well as seaweed. It really helps soften the seaweed so it folds up easy and clean when using a veggie clip or rubber banding to a rock. What size of container are you offering at $19.99?